The exponential growth of data worldwide has made managing backups more difficult than ever before. With traditional methods such as tape libraries and secondary sites falling behind, many organizations are extending backup targets to the cloud. While the cloud offers better scalability, building cloud-enabled backup solutions requires careful consideration of existing IT investments, recovery objectives, and available resources. This is where Amazon Web Services (AWS) can help. We offer the most storage services, data-transfer methods, and networking options to build solutions that protect your data with unmatched durability and security. Learn more about Benefits of AWS Backup, the AWS Partner Network for Storage & Backup, Use Cases, Customer Case Studies, and Evolving Backup into Archive & Disaster Recovery. Learn about the benefits customers are realizing by working with AWS to extend backup targets to the cloud. Protect backups with 99.999999999% data durability. Copies of all data uploaded to Amazon S3 and Amazon S3 Glacier are created and stored across at least three devices in a single AWS Region. Even when following best practices, on-premises capabilities cannot match AWS’ durability due to our global scale and security. Scale up your backup resources in minutes as data requirements change . With AWS, you no longer need to wait weeks-to-months to procure tapes, disks, and other IT resources to increase your storage infrastructure. This ability to scale on demand can improve operational flexibility, innovation, and business agility. Spend efficiently with pay-as-you-go pricing, cost-management tools, data lifecycle policies, and the S3 Storage Classes, including S3 Standard-Infrequent Access, S3 One Zone-Infrequent Access, S3 Glacier, and S3 Glacier Deep Archive. With these capabilities, you can cost-effectively protect data in the cloud without sacrificing performance. 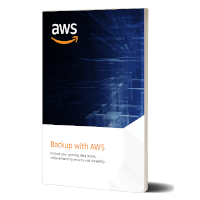 Sending backups to AWS can be the first step in reducing total cost of ownership and your data center footprint. Protect backups with a data center and network architecture built for the most security-sensitive organizations. Manage access, detect irregular activity, encrypt data, and perform audits with AWS Security services. AWS also maintains compliance programs to help you meet all of your regulatory requirements. Learn more about B&R AWS services and experiment with Tutorials, Projects, and Guides. The AWS Partner Network (APN) is the largest community of cloud consulting and technology providers. All APN partners have proven technical expertise of the AWS platform and customer success with their products and services. AWS Storage Competency partners offer AWS-integrated storage solutions for primary storage, backup & restore, disaster recovery, and data archive. Working with these partners can help your organization (particularly if you're managing legacy infrastructure and applications) deploy capabilities that send data to the AWS Cloud for durable storage and protection. Another customer resource is the AWS Marketplace, an online catalogue offering over 3,500 software listings from over 1,100 independent software vendors, where you can explore, purchase, and deploy off-the-shelf cloud storage solutions. All listed solutions support a variety of AWS storage services, and are ready for deployment and immediate use. Learn how you can work with partners to back up data to AWS. With cloud connectors and gateways, customers can begin backing up their on-premises data to the AWS Cloud for durable data protection. Use AWS Storage Gateway to create virtual tape libraries and eliminate the responsibilities of overseeing procurement cycles and error-prone processes. Many AWS database services (relational and non-relational) have built-in, automated backup capabilities to protect your data and applications. Amazon S3 offers different storage classes to store less frequently accessed data at variable costs. Use lifecycle policies to automate tiering or do this on demand. Amazon S3 offers cross-region replication to replicate data in other AWS Regions for compliance, security, disaster recovery, and other use cases. Organizations with data-retention requirements can use Amazon S3, S3 Glacier, and S3 Glacier Deep Archive for low-cost, long-term storage that has built-in capabilities to enforce WORM controls. King County uses AWS for long-term archiving and backup solutions. Thomson Reuters leverages Amazon S3 to store and protect permanent backups. Unliever uses Amazon S3 and Amazon EBS snapshots to protect backup data in the cloud. Hess uses Amazon EBS snapshots to create nightly backups, and then stores database backups in Amazon S3 and the S3 Glacier storage class for long-term archiving. Once backups are in the AWS Cloud, you can cost-effectively archive them. S3 Glacier and S3 Glacier Deep Archive are designed to deliver 99.99999999999% durability, have capabilities to meet compliance requirements related to data retention, and cost $0.004 per gigabyte per month and $0.00099 per gigabyte per month, respectively. Another benefit of having backup data in AWS is the access you have to cloud-native tools that can evolve your backup solution into one for disaster recovery. Use AWS services to rebuild on-premises environments and create resiliency against natural disasters and failures.